Share your critter-based bliss for the Santa Rosa-based animal park with loved ones and friends. Share your critter-based bliss for the Santa Rosa-based animal park with loved ones and friends. Part of each card sold will help North Bay Fire Relief. IF YOU'VE JUMPED ON A JEEP... at Safari Park in the past, or joined a special holiday brunch, or ventured to the expansive property for a special talk, or you've spent the night, then you likely know what it is to want to tell all of your friends about it. Your pal who digs meerkats would be first on your must-tell list, and your giraffe-obsessed bud, and all of your relatives who are into conservation and helping out our co-earthlings, be they long of snout, purrful of nature, or so inquisitive that they'll happily leap inside the pumpkin they're eating (we're looking at you, meerkats). One way to spread this "you gotta go there" love among those you know? Holiday gift cards, of course, and Safari Park has them. They're mighty awwww-dorable, as you'd expect, with an animal-riffic design, but the most awwww-some part is that the gift card will help inspire your loved ones to plan a trip to the park. MORE LOVE TO GIVE: The Santa Rosa-close park, as its fans know, just recently weathered the fires of October 2017. So not only will the gift cards help the gifters and giftees connect with the 400-acre property and its denizens, but a portion of each gift card sale will help North Bay Fire Relief. 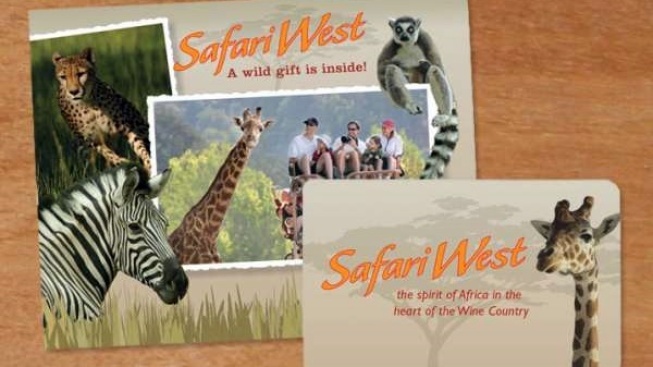 The Safari West Wildlife Foundation is also a beneficiary of part of each gift card sold, a heartwarming thing. If you've been thinking of your merry meerkats and your fabulous rhinos, and the incredibly difficult time the Safari West staff faced in the face of the close-of-hand fires, give some love, via a few gift cards, which will, in turn, spread that goodwill further on.